The cottage is in Oceana County, about two miles south of Stony Lake. The cottage is far off the nearest road, with a huge private sandy beach. The lake bottom is also sandy--no rocks or stones. We have 200 feet of frontage on Lake Michigan, and there is plenty of wood for beach fires. The cottage is in a rural area which keeps it quiet. The nearest store is 2 miles away in Stony Lake. There is a stall shower, but no tub. Room was remodeled in 2017. The cottage has its own private beach on Lake Michigan. The cottage overlooks Lake Michigan with a private sandy beach. Paper goods and spice rack. New appliances, sink and countertop. Front patio has a picnic table. There is another table overlooking the lake. There are several courses close-by. One standard double, one set of bunk beds & one sofa. Oven; refrigerator/freezer; shower. Because it is a rural area right on the Lake, your cell phones may not work. Many folks find that to be an advantage. Enjoyed peace and quiet. Fun memories made. Sunsets were unbelievable. Dog loved the waves. Cottage was nicely decorated. Coming back next year! We stayed at Sandy Shoes for a week in October for our anniversary. This was our 2nd time staying at this wonderful cottage. We had wonderful weather almost daily and were able to take advantage of Lake Michigan and the sandy beach with our happy pups regularly. We highly recommend this cottage for a relaxing, refreshing, unplugged getaway! It is well maintained, clean, cozy and just perfect. We can't wait to return again! We were looking for a quiet get-a-way for our anniversary, and we found it. The cabin is a little dated, but is very clean, quiet and comfortable. Enjoyed using the Kayak and having campfires by the beach. Neighbors were friendly and accommodating. Stoney Lake Inn restaurant (about 2 miles away) was a great place to grab some dinner a time or two. We stayed at Sandy Shoes for one week in October. The location is perfect and the amenities included were above our expectations. Aside from bringing our towels and sheets, the cottage was fully stocked with everything you may need. We cooked almost every night with no probs. Clean cottage that is well-taken care of. Dog friendly which is fantastic! The owners were friendly & courteous. There is close, easy walking access to the beach which we frequented daily. Soft sand that is easy on your toes! We took a ton of hikes around the area too. Plus there is a really great farmer's market in Muskegon downtown which is a short (30min) drive away. I'd recommend this cottage for anyone who is looking to get away from the hustle and bustle of everyday city life to enjoy a relaxing, serene vacation. We had limited phone reception (which was a plus for us!) and we brought a few DVDs to watch and books to read. Thank you Jim for a wonderful week! This little cottage packs so much fun and relaxation. Clean and comfortable and close to many fun attractions. Two days of rain kept use comfortably inside the cottage to relax with reading and games. Boy we needed this peaceful vacation. The beach was spectacular with a few magnificent sunsets! So glad we could bring our two little fuzzy friends along also! Great location, perfect to get away from it all. Beautiful views, gorgeous private beach. Away from it all, but a short drive to Silver Lake for dinner and shopping. And it was pet friendly, so our dogs were able to enjoy the beach with us as well. Would highly recommend this property to anyone who wants to escape the fast lane and simply relax! 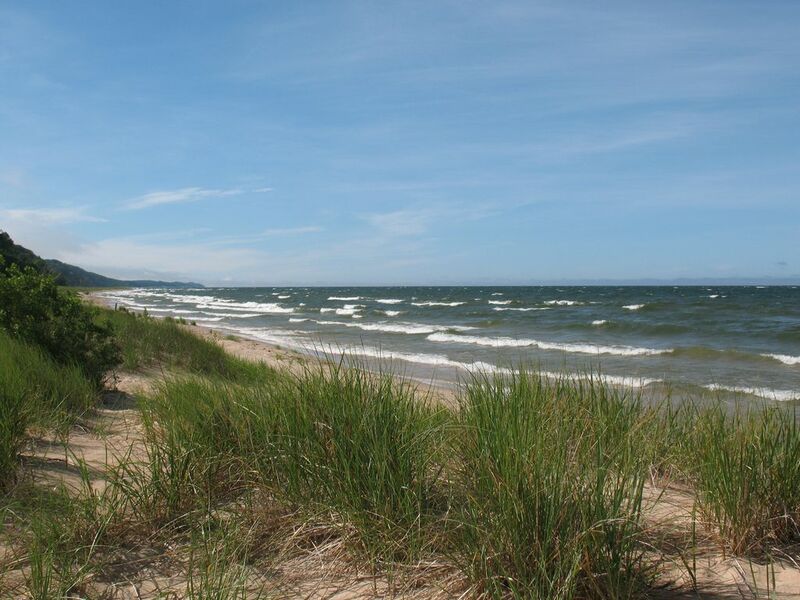 We are 15 minutes from sand dune rides, 20 minutes from the largest amusement park in Michigan, and close to 6 golf courses, including a championship course. The area is rural, so it is good for bicycling. We are also close to a 22 mile long rail trail. There is a local butcher with excellent steaks, a winery, a dairy with great ice cream, and cherry orchards with wonderful desserts; you should never be hungry. It is about a 4 hour drive from metro Chicago or Detroit. We accept personal checks, but not credit cards.